Trustees meet in a work session to discuss Township issues. 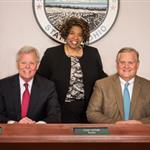 The Regular Work Sessions of the Board for 2019 will take place on the fourth Tuesday of every month at 8:00 a.m. in the Township Administration Building located at 9150 Winton Road, Cincinnati, OH 45231, with the exception of the December Work Session, which will take place on the third Thursday, December 19th, 2019. Work sessions are open for public viewing, however there is no citizen participation in work sessions.